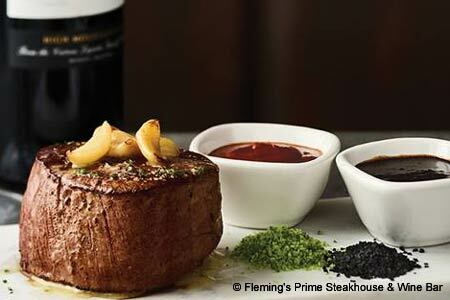 An upscale chain steakhouse that delivers quality and ambience without the usual steakhouse sticker shock. : Located in the Theater District across from The Boston Park Plaza Hotel & Towers, Fleming's is owned by the folks behind nearby P.F. Chang's China Bistro. The main dining room is done in shades of crimson and amber, with lots of red leather. The topnotch wine program targets both the casual sipper (with 100 wines by the glass) and the rarity-seeking connoisseur (with a reserve list). The open kitchen turns out a standard collection of quality sirloin steaks, rib-eyes, New York strips and filets as well as some nice seafood offerings like Alaskan king crab legs and North Atlantic lobster tails. Sides take on interesting twists, like the specialty creamy potatoes made with jalapeños and cheddar as well as the chipotle cheddar macaroni and cheese. Desserts include walnut turtle pie, chocolate lava cake or the three-layer carrot cake topped with dark rum caramel. Check out the 5 for $6 ‘til 7 bar menu available nightly that offers cocktails, wines by the glass, appetizers and a burger.